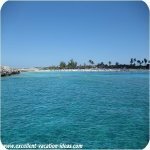 Costa Maya Tours - Costa Maya Mexico is an awesome port of call in the Western Caribbean - Built with cruise ship passengers in mind - Costa Maya Mexico! There are all sorts of tours to choose from at the Mexican port. We chose to go privately and go to the Maya Chan resort. 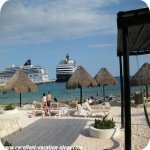 Here is our day in Costa Maya. 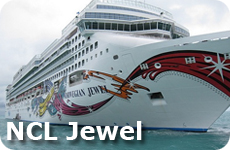 This was our favorite day of our cruise on the NCL Jewel. We got up and had some breakfast in our cabin excited that we were off to this resort for the day! People had talked about it on Cruise Critic. I can honestly say that it was as good, if not better, than what they said. We walked off the ship (no tenders!!!) and walked through the port. I have never seen a port that was built for cruise ships like this one. There was a beach, shops, restaurants, bars and even a swimming pool complete with a swim up bar. You didn't have to leave the port to have a nice day. 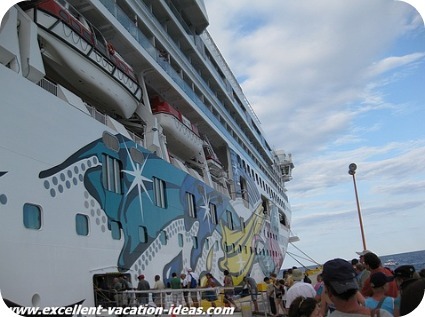 We walked outside the port and could see the cruise guests getting ready for their Costa Maya Tours. We headed to the taxi stand and met up with the very friendly representative that put us in a taxi (taxi fare was included) and off we went. It isn't very far to Maya Chan from the Port, but the road is really beat up. It took longer than it should to get there, but it was a nice drive along the beach. 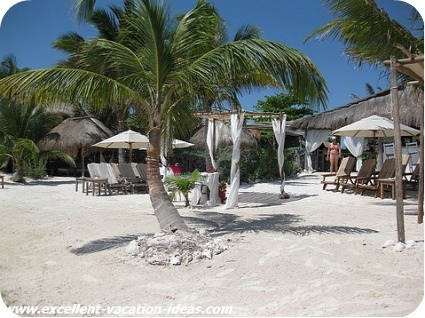 Maya Chan is a private day beach resort, that caters mainly to the cruise ship excursion market. It was built by an avid cruiser, Mark and Jane Ostrow and run by their son David. Mark and Jane are avid cruisers from San Diego. They got tired of going on cruises and doing shore excursions and Costa Maya tours to mediocre or not so great beaches. They just wanted to relax and not have to hassle with street vendors, loud music or small dirty beaches. So they bought a plot of beach property in Costa Maya (a cruise destination they loved), spent 2 1/2 years building and created Beach Resort. I have to tell you they have done an incredible job! We were told before we arrived that there would be a wedding there that day. They asked for our cooperation and asked us to stay to the North side of the resort. This was really quite easy to do. Their customer service is amazing. Anything that we needed or wanted they would do their best to get or do for us. The best part for Warren and Montana, they had free internet! It was better than the ship that was for sure! So you can imagine how excited they were. 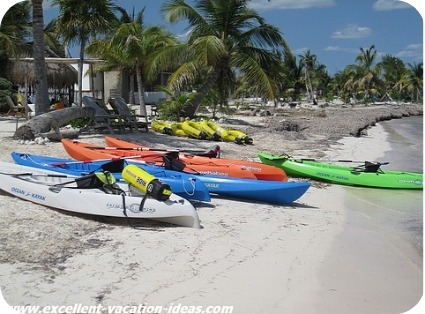 All of the drinks and food was included, as was the kayaks, and snorkelling gear. Zack, our "server" for the day, also offered a bike tour in the morning down the coast, and a kayak/snorkelling tour in the afternoon. We all got massages, in fact when Montana and I were getting a massage, we could hear the wedding vows for the couple that were getting married. David, the General Manager, got his minister license online and married the couple. It really was a beautiful setting for a wedding! David did a great job! After the wedding we all mingled in together and had lunch. 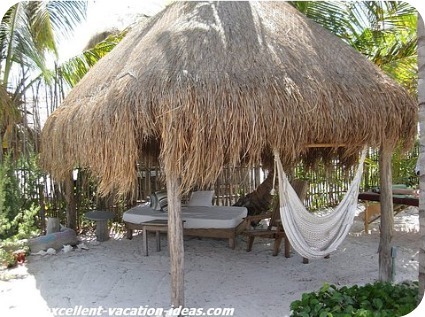 Everyone had their own beach chairs and/or a palapa (covered beach bed). 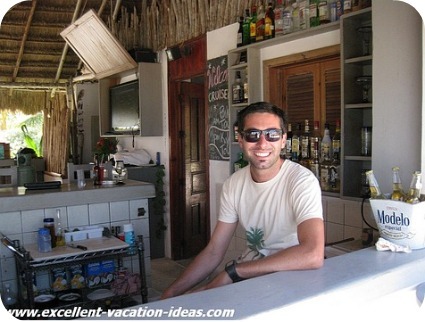 The staff were awesome, and would do everything they could to accommodate every guest. If you needed more shade they would bring you an umbrella. They were always around for drinks and you could go to the bar to get them. Hammocks to sway in, and fresh water showers. Lunch was great, it was chicken, steak and fish fajitas, cooked over a BBQ pit. We were sad to leave, but Montana and I wanted to check out some of the shops. So they arranged for a taxi by 3 pm and off we went. 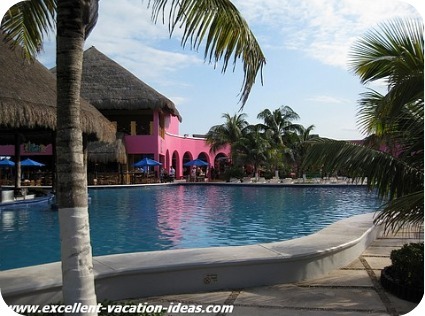 If you are considering this beach resort for your Costa Maya tours, and would like to book Maya Chan Beach, I would do it as soon as possible. I think that it will become very popular soon, and they restrict the number of guests they allow (which adds to the charm and greatness of the place). At the port we did some last minute shopping and watched the other Costa Maya Tours return. Montana decided she wanted to get an initial ring made so after some discussion with a very persuasive and flattering "salesman" she got one done. However, it took longer than we thought it would and we were in the last group of passengers to board the ship! Note to self - leave more time to get back on the ship to avoid stress about worrying about missing the ship! Thankfully there were some Costa Maya tours that were late returning too. Mexico's cruise port. Costa Maya was built to accommodate the cruise ships. 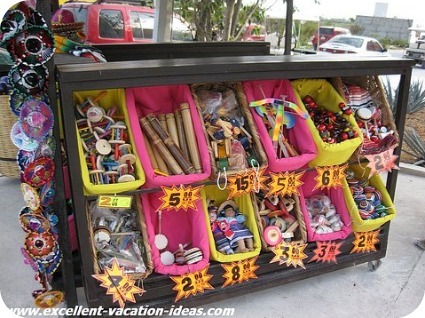 You can enjoy the beach, explore Mayan ruins, enjoy a drink at one of the many bars, go ATVing or shop till you drop. NCL's 250 acre private island in the Bahamas. 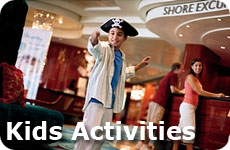 Enjoy beach combing, snorkelling, sunbathing, swimming, beach sports, or hanging in a hammock.